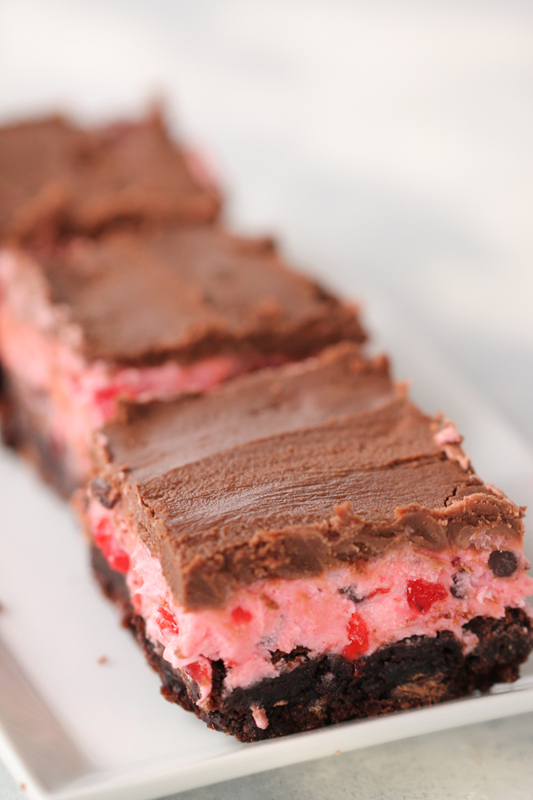 If you love chocolate and cherry together, this is the ultimate brownie for you! The brownie bottom is so easy to make. Then top it with the ultimate cherry goodness, then another layer of chocolate. After one bite you'll be ready to polish off the whole pan. Every Christmas season we would always have chocolate covered cherries. Our grandpa Tom was the biggest chocolate cherry lover. We would give them to him every year for Christmas. We share his love for the flavors of chocolate and cherry combined. These brownies are the bomb! 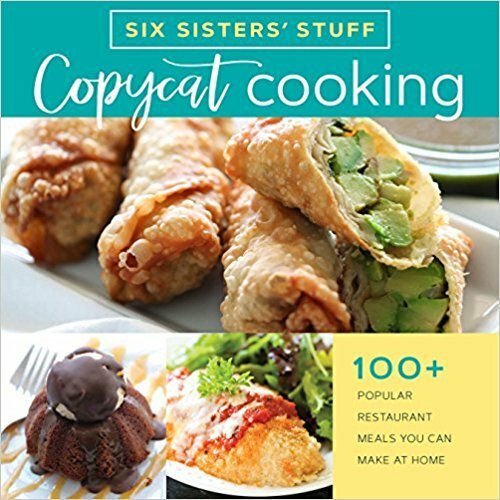 They are so easy to make and look like you spent a lot of time in the kitchen. The cherry layer is as easy as mixing some amazing ingredients together. And then the chocolate layer on top is done in the microwave. So easy and it just keeps getting better. The cherry filling in the middle layer has mini chocolate chips and tastes like Ben and Jerry’s Garcia ice cream. That is one of our personal favorite ice cream flavors. can you use homemade brownie batter in place of store bought mix? 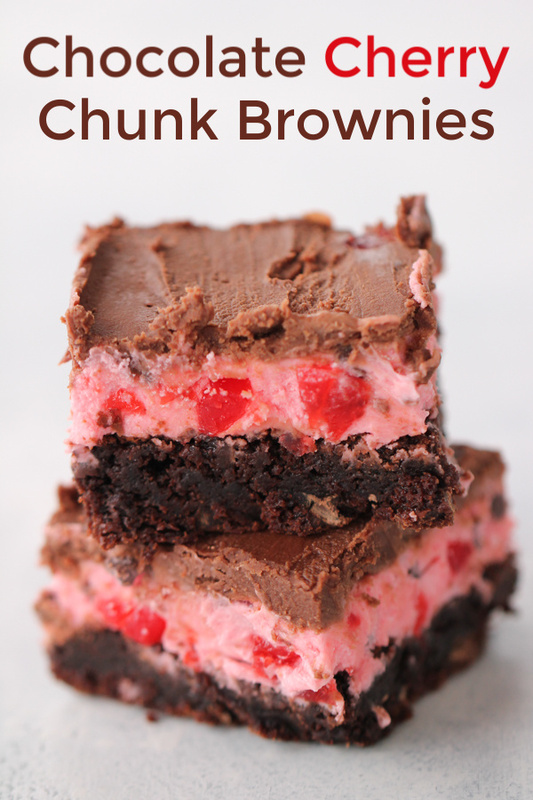 We used a store bought brownie mix for these Chocolate Cherry Chunk Brownies. It is easy and convenient. There are so many flavors available at the store with extra chocolate chunks and mix ins added. Any brand works great. These brownies also work great with your own homemade brownie recipe for a 9 x 13 inch pan. Just make them in the pan and let them cool completely. We love using our Fudgy Brownies recipe in place of a store bought mix when we don’t have one on hand. Whether you use a store bought mix, or make your own brownies, these taste amazing. We love a good brownie and these Chocolate Cherry Chunk Brownies won’t disappoint. can other pan sizes be used for these brownies? These Chocolate Cherry Chunk Brownies are specifically for a 9 x 13 inch pan. If you were to use a half sheet baking pan, they would be too thin and the cherry layer would not spread over the entire pan of brownies. If you need a bigger batch of brownies, be sure to check out Mom’s Famous Marshmallow Brownies. They make a big pan if you need more to feed a big crowd. These Chocolate Cherry Chunk Brownies feed about 24-30. They are very rich and filling. It’s a taste of Heaven! Have we convinced you to make a batch yet!!?? 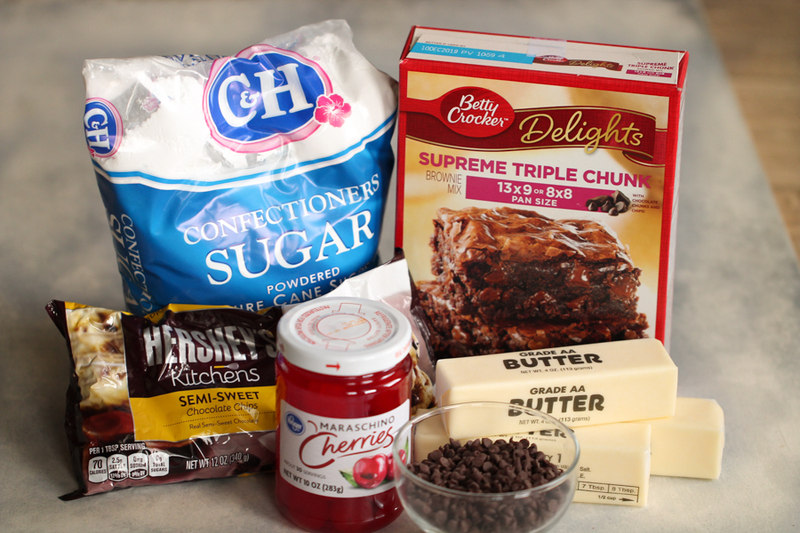 Here are the simple ingredients used to make these amazing chocolate cherry chunk brownies. Prepare the brownies as directed on the box for a 9 x 13 inch pan. if using a store bought brownie mix. If you are using a homemade recipe, make the brownies and cool completely. In a medium sized mixing bowl, combine the butter, powdered sugar, and maraschino juice. Mix until creamy and smooth. 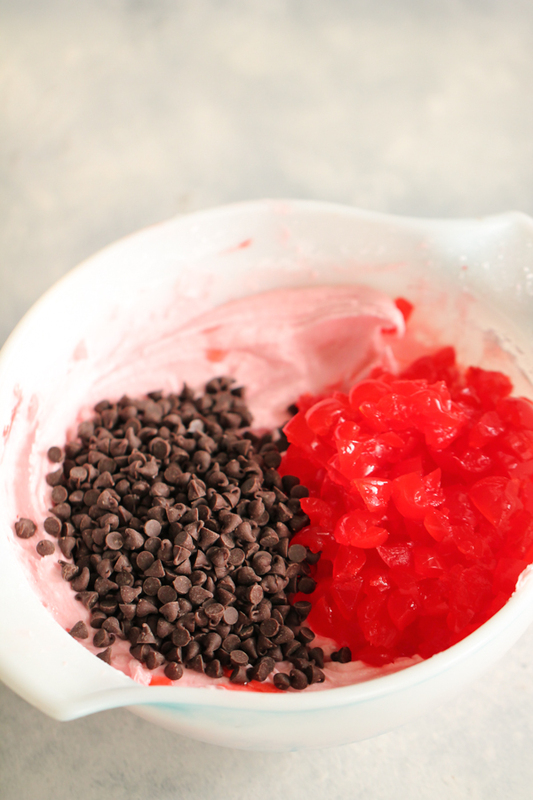 Then fold in the chocolate chips and chopped maraschino cherries. Spread the mixture over the top of the cooled brownies. 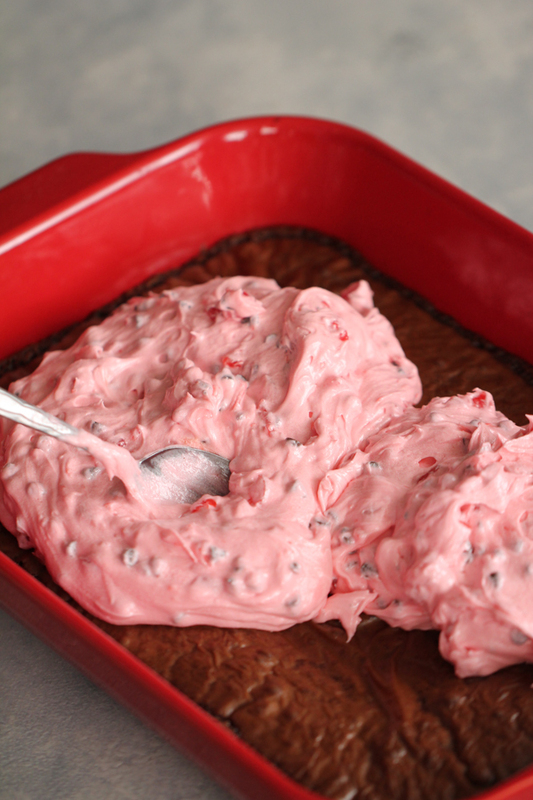 Place in the fridge or freezer for about 30-45 minutes until the pink cherry layer is set up well. The chocolate layer on top is warm and will melt the pink layer. So you want it to be set up well. After the brownies have had a chance to set up well, mix the chocolate chips with the butter and melt in a microwave safe dish. I like using my big 4 cup glass measuring cup. Heat at 30 second intervals until creamy and smooth. When all melted, spread quickly over the cherry layer which has set up well. Spread quickly because the chocolate will want to set up when it hits the cold cherry layer. Place in the fridge to set up. Then cut and serve. Hand Mixer – We just got this hand mixer and absolutely love it. Love the pulse feature. Mixing Bowl Set – This 4 piece bowl set comes with tight fitting lids. 9 x 13 inch Baking Dish – We love glass baking dishes and this one comes with a nice fitting lid. Prepare brownies mix with the water, vegetable oil and eggs that it calls for on the box. (Every box can vary slightly) Bake as directed on the box. Let cool completely. In a medium sized mixing bowl combine butter, powdered sugar, and 3 Tablespoons of juice from the maraschino cherries. Remove all of the cherries from the jar and chop. Fold in the chopped cherries and chocolate chips into the batter. Place in the freezer for about 30 minutes to let the cherry layer set up well. Melt chocolate chips and butter together in the microwave at 30 second intervals. Stir, and repeat for 30 more seconds. Continue to do this until chocolate is smooth and melted. Spread over cherry-chocolate layer. Spread quickly because it will tend to set up when it hits the cold cherry layer. Let set up until hardened (stick in the fridge if you need them set up faster) and then cut and serve. Kristen shows us how easy it is to make an easy Apple Dump Cake in the Instant Pot. I had chocolate and cherries on my mind today too! These brownies look killer! These look amazing! Cherry Garcia is my absolute favorite Ben & Jerry's Ice Cream ever- I must make these soon! Thanks for the recipe. These are my kind of brownies! I Love Cherries and any recipe that they are in. I could definitely eat the cherry layer with a spoon! Uuuummm no words come to mind at the moment other than YUM!!! Ok, maybe a few more like amazing, delicious, you are awesome!!! You get the point. My husband loves chocolate covered cherries. I plan on making this for him for Valentine's Day dessert. Thanks!! Oh my goodness! Those look so yummy! Thanks for sharing the recipe! this looks AAAAAmazing. we have our first linky party.. will you link up with us? OMG! I don't want to know how many calories are in these things....but oh.my.goodness they look sinful!!!! YUM! Chocolate and cherries = delicious! Happy Friday!! i tried these today and they did not come out looking like this!! :-( the cherry filling absorbed the top layer and everything became soggy! suggestions? 1.Use 3 T juice for the icing (more juice will come from the chopped cherries as they are worked in to the icing). 2. Freeze for about an hour after the cherry layer is added (it needs to be really cold so the warm chocolate doesn't melt the cherry layer). I disliked these strongly. My mother asked me to make these on a whim since they looked so good. Needless to say, they were nasty. The chocolate was way over the top in quantity and the frosting was too sweet. No one in my family liked them even though we're all huge chocolate covered cherry fans. Waste of energy and money. I won't be making these again. I just made these last night for a gingerbread house decorating party we had last night ... seriously AMAZING! Everyone couldn't get enough of them!!!! As Karli mentioned aboved, the top chocolate layer was too thick (that didn't stop anyone from gobbling them up though!). Next time I will make a very thin layer of chocolate on top. I made these last night and they turned out really well! I did make some changes though after reading other comments. 1. For the cherry layer, I used 10 ounces of cherries, 3 tablespoons of juice, and I taste tested as I added the powdered sugar and decided to stop at 3 cups. It tastes like cherry frosting, not Cherry Garcia, to me though. 2. I only made 2/3 of the top chocolate layer (1/2 c butter and 1 1/2 c chocolate chips). And I put the pan in the freezer before added the top layer so it didn't melt the cherry layer. I think it was probably easier to cut them while they were frozen as well. I made them for a bake sale, so I haven't heard what others thought of them yet, but I thought they were delicious! I love chocolate and cherries together! Perfect for Valentine's Day! Chocolate + Cherries is such a YUMMY combo!! Thanks for the awesome recipe :) Pinning! These looks so great and just in time for Valentine's Day! Thanks for linking up with us this week! Ok, so you so HAVE to make some for me!! They look sooooooo good!!!! YUMMY!!!! These were a big hit with a few changes. I simmered all the juice from the maraschino cherry bottle to reduce it to 5 T. This concentrated the flavor and kept the frosting layer from being runny. I cooled the juice before adding it to one stick (1/2 cup) of butter. Halving the butter was unintentional, but it turned out great. For the chocolate layer, I used all the chocolate, but only 1/2 cup butter. It was a thick layer of chocolate, but no one complained. Next time, I might just add more chocolate to the cherry layer or sprinkle chocolate chips over it instead of doing the melted chocolate layer. I cooled the brownies overnight before adding the cherry layer. I also let the cherry layer harden a bit before adding the chocolate. This was sufficient for February, but I imagine they cherry and chocolate layers would be a gooey mess in a warmer month.